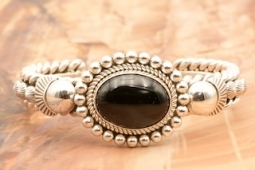 If you have 'Rising Sun Sterling Silver Black Onyx Bracelet by Artie Yellowhorse' in your shopping cart go to View Cart at the top of the page to check out. If you are having any problems with the checkout process we are here to help. Call us toll free 1-877-892-0297 to place your order. Heavy Gauge Sterling Silver Bracelet with a Stunning Genuine Black Onyx Stone. Created by Navajo Artist Artie Yellowhorse. Signed by the artist. The Yellowhorse trademark "Rising Sun" design is one of their most popular collections with its round or oval-domed center surrounded by small 'drops' or beads of silver - each one made by hand.